MY EAST COAST COLLEGE son enthuses about mass transit, specifically about the T in Boston. It’s his go-to form of transportation if he’s not walking or unicycling. The lack of wide-spread mass transit in Minnesota frustrates him. As I see it, cars, cost, lower population, and a much larger geographical area all factor into less public transportation availability here than out East. I’ve reminded him that many a compact East Coast state would fit inside Minnesota’s borders. We don’t have nearly as many people living here as there. 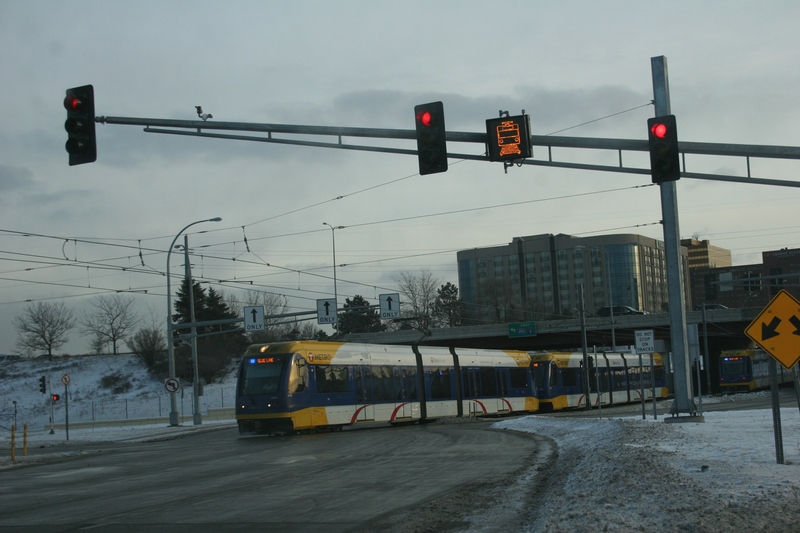 The light rail heads toward the Minneapolis-St. Paul International Airport. To be fair, mass transit exists in Minnesota’s larger communities and cities with bus service and, in the Twin Cities metro, light rail. And even in rural areas, limited bus service is available in some counties. Decades ago, when I visited my Aunt Rae and Uncle Bob each summer, riding the Greyhound bus solo from my Uncle Harold’s gas station along Highway 19 in Vesta in southwestern Minnesota all the way to downtown Minneapolis, I experienced big city mass transit. An excited nervousness jittered through me as Rae and I boarded a Minneapolis city bus to wherever she wanted to take me. To the Munsingwear warehouse to sort through piles of fabric. Or maybe downtown to view an art exhibit. Specific destination details mostly elude me now all these decades later. But the wonderment of wheeling along narrow city streets, the bus pulsating to a stop, door swishing open, passengers boarding, remains with me. To be young and in the big city hustle far from corn and soybean fields and bellowing cows opened my eyes. I saw beyond rural. I saw the possibilities. Another life. Another world. Not that I ever fell in love with the big city. But riding the bus through Minneapolis sparked something inside me. A yearning for art galleries and music and museums and architecture. A library. An appreciation for people who didn’t look like the German Lutherans and Catholics back home. An almost dizzying awareness of noise and lights and motion. And tall buildings. 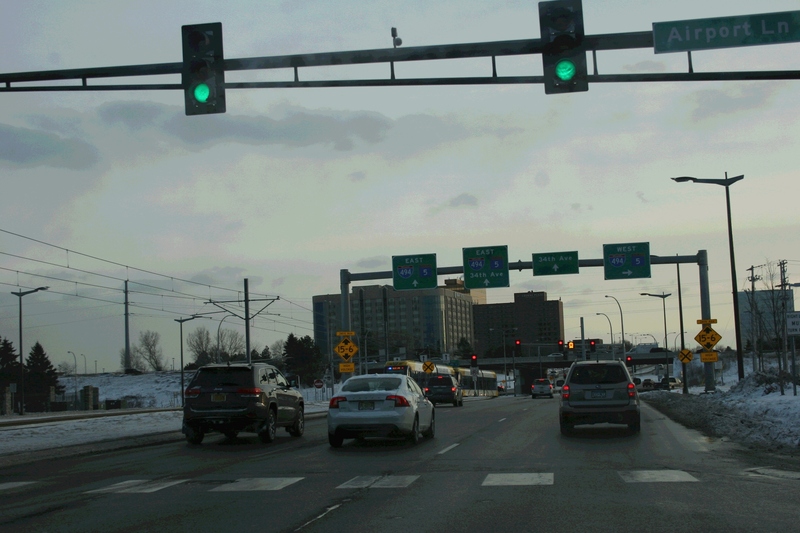 Vehicle traffic and light rail meet at this oddly configured and confusing intersection near the Minneapolis-St. Paul International Airport. I wonder if, today, a young girl from outstate Minnesota boards the Metro Blue Line (light rail) with her parents, perhaps headed to Target Field for a Twins game or to the Mall of America, and feels the same thrill I experienced decades ago riding the bus through the streets of Minneapolis. Does she imagine the possibilities, study the faces, note the traffic, delight in her destination, desire to explore more of the city? Or is she overwhelmed by it all, wishing only to leave? FYI: The Minnesota Department of Transportation has a statewide rail plan for an inter-city passenger rail line running from the metro to my community of Faribault and perhaps farther south. This proposal is in the early discussion stages. Click here to learn more. If MN ever has it eyes on the Olympics, they will need to expand mass transit even more. I would absolutely love to see a commuter rail spur venture down to Red Wing – I would be all about that. That would make your commute a lot easier and less stressful, I’m sure. I spent half my life aboard the Selby-Lake bus (21A). The other half, I spent on the 53J riding from Chaska to my job at Minneapolis City Hall. On the 21A, you learned quickly to become one with the seat and not talk to anyone or make eye-contact. You had to deal with the screamers, the drunks and the gang-bangers. It wasn’t all bad though, at times there was music – blasting from competing boom-boxes. The 53J was another world completely. We were like family. We got together for “bus picnics” on weekends. To give an example of how close we were, I overslept one-day and was sitting on my steps with a cup of coffee when the bus rolled past my house. It stopped and the windows flew open, my friends on the bus shouted for me to get my rear-in-gear. The bus waited across the street until I got myself together and hopped aboard. I hear the 21A is becoming more like the 53J these days. That is wonderful news. These things always go in cycles. It was interesting to read stories from someone who rode the bus on a daily basis. Love that bit about 53J riders becoming like family and shouting at you to get your rear in gear. And bus picnics? Thank you for sharing this insight into bus ridership/humanity. My daughter lives in Boston, she went for a year and now that has turned into six. It has given us an opportunity to visit and each time I am amazed at how easily we move about to reach our destinations. She has now moved to the “burbs” and uses a car to go to work but assures us that she is on a commuter rail (which she uses to go into the city) and we will still be able to ride. My husband has said he would move there if he could get a job that allows him to ride the train to work, we would move! Loved the comment about Munsingwear, growing up in St. Paul, we had a neighbor that had purchased a used serger sewing machine from them and we would travel about once a month to shop for fabric. If I wanted a new shirt I would hop the fence, pick my fabric, she let me cut it out and would have it sewn about 15 minutes later. All of our nightgowns, actually long shirts, were also made by her! I have a pic of me with my firstborn in the hospital wearing one. Another childhood memory is riding the train from St. Paul to Rochester to visit Great Grandma, Dad would put me on and I usually rode in the observation car and it dropped me off 2 blocks from her house where she would be to greet me. Oh such fun times. My husband, a railroad buff, has said that if they had left the tracks in place that were torn up in the 70’s, we would be able to travel all over southern MN without all this hoopla. A sad part for us is that if the Zip line to Rochester is built, Hubby’s brother and family would be displaced. They have 7 acres off of 52 (Hader Corner) and they have worked hard to make it a wonderful place to spend time. It would also bypass all the lovely little towns along the way. We attended the meeting in Kenyon last spring and was very disheartened to hear the State’s stance on it. It was pretty much if Mayo wants it, then Mayo gets it. Thanks for the stroll on Memory Lane. Deb, I so enjoyed your comment, especially your memories of Munsingwear and your neighbor. I hadn’t thought about Munsingwear in decades until I was working on this post. My Aunt Rae loved to sew. Each year for my birthday, she would sew a dress for me. Sometimes I even chose the pattern and fabric. She knew it likely was the only new dress I would get that year. Our family had little money. You’re right about tearing up the tracks. Your comment about “if Mayo wants it, then Mayo gets it” is enlightening, although that’s not the first time I’ve heard such similar thoughts. It will be interesting to see what happens. Yeah, I’m thinking my son’s time in Boston could stretch beyond college. I hope family brings him back to the Midwest at some point. But, the direction he’s going now with his education and plans for his future do not indicate that. What an interesting post and comments! Growing up in rural Nebraska, I didn’t have an experience on mass transit in a large city until my late 20’s. Over the years my husband and I have traveled fairly extensively, and I have a tremendous appreciation for my still, very rural life where I can hop in my truck and drive anywhere without much fuss. I also have an appreciation for mass transit in the large cities, but I admit, one cannot be lax about keeping to schedules and promptness. While in Boston sometime back, we had to take a shuttle van, then a bus, and finally a commuter train so that we could travel to Salem, on Halloween. We missed the bus at the stop (at a mall entrance) as we were inside the mall keeping warm from the bitter cold. Since no one was outside at the curb in the snow waiting on the bus, it just passed by! Here in the Midwest, a bus stops at each stop for at least a minute to allow people to come out from inside. So we had another 30 minute wait to the next bus… which of course made us late to catch the commuter train… which caused us to wait another hour to get on the next commuter train to Salem! This summer we were in NYC and found the trains to be a wonderful experience. The train station employees were not friendly nor very helpful but the locals were great. And, it was nice to find other tourists helping out and offering information. You certainly have way more experience with mass transit than me. Interesting how the bus did not even stop in Boston. I recall my son telling me about racing to catch the T so he wouldn’t miss his flight. And then, more recently, he hopped on a rail at the airport in Atlanta only to discover the rail did not loop. He ran then, too, to catch his plane. He’s learning. For the most part, it sounds like you’ve learned how to navigate mass transit, even without the help of unfriendly train station employees. What do you mean by “finally has a highway to it?” Do you mean interstate? Sounds like mass transit is working great for you. Alright, got it. Thanks for the explanation. I am a slow down and smell the roses type of guy. By necessity I must fly to my 2nd office two to three times a week, leave in the morning return that evening repeat all over again the next day, blah. When I am fortunate enough to be back in the Midwest I always look forward to the “road trip” and allow extra time for it! No fast highways for me I much prefer the back roads and the rural sites and small towns it provides. In a large city I can certainly understand the need for a mass transit system, however I never wish to live in a large city and thus will hopefully not have to deal with it. Where I currently live has over the years gotten much to big for my liking………… I am and always will be, a small town guy! Flying to your second office once or twice a week. Hmmmm. I assume this is a short flight. I hope some day soon you can get back to the Midwest you so obviously love and appreciate. It’s interesting to hear all about the various forms of mass transit. Thanks for the report from Sydney, Charlie. This is entertaining and hilarious. Thank you. Readers, this video is well worth the watch and listen. Thought I’d stop back to add a thought. Most people view commuting as suburbanites riding the bus or light-rail to jobs in the center city but the fastest growing trend in transportation is the “reverse commute”. People who live in the inner-city are riding the bus into the suburbs to work in light industry. Another trend is a reversal of the long distance rural commute. For instance, I live near Austin and until this year, I commuted to my job in the Twin Cities where I lived in a small condo during the week. A large number of people, mostly immigrants, do the opposite. They live in the Twin Cities and commute to Austin and other meat processing plants to work. They share an apartment with a couple of buddies during the week and return to their families on weekends. These people come from some rather exotic ethnic communities, such as: the Burmese and various groups from South Sudan. I just learned a whole lot by reading your comment. Thank you for sharing your insider knowledge.